In 1930 Truus Schröder-Schräder bought a patch of land across from her house. She and Rietveld then designed two blocks of three and four dwellings. The project fell through but in 1931 Rietveld made a new design for a row of four dwellings. Intended as a prototype for mass housing, this block has a steel frame, wood floors and brick party walls. The living room can be subdivided into smaller spaces using sliding partitions. The ribbon windows, steel window and door frames, white rendered walls and flat roofs are proof that Rietveld had embraced functionalism once and for all. 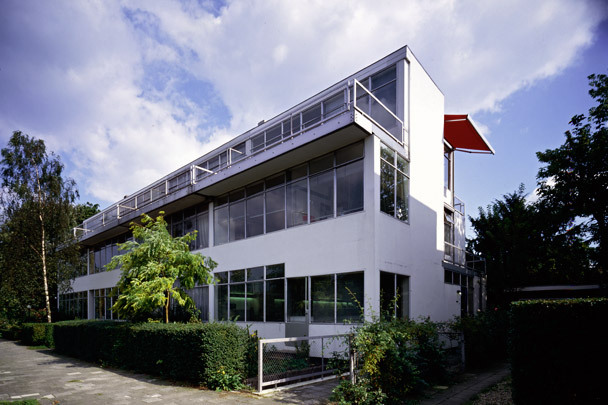 One dwelling was fitted out in October 1931 by Rietveld and Schröder as a display home with self-designed furniture which was taken into production by Metz & Co. The Centraal Museum in Utrecht has reconstructed the original interior design of Erasmuslaan 9 and opened it to the public as a museum house.